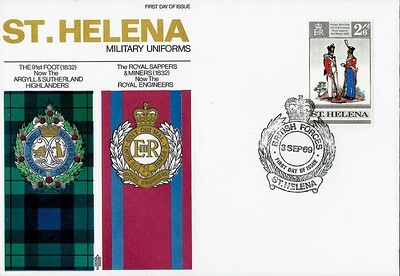 Covers issued by others outside of the R.E. 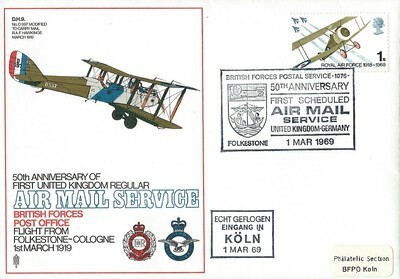 50th Anniversary of First UK regular Air Mail Service Flight from Köln - Folkestone 1st March 1919 Commemorative Cover The RE badge denotes the fact that the RE were responsible for Forces Mail. Stamps: 1s Royal Air Force 1918-1968 commemorative, issued 29 May 1969. Cachet: Flown Cover Received Folkestone 1 Mar 69. Border: Solid line in olive. Special Handstamp: 50th Anniversary First Scheduled Airmail Service Germany-United Kingdom BFPS 1077, Köln's coat of arms shown to the left. 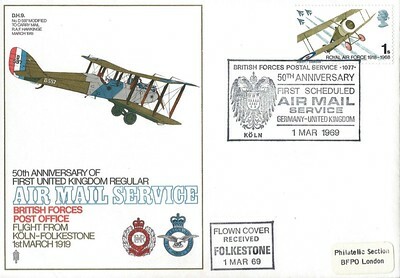 50th Anniversary of First UK regular Air Mail Service Flight from Köln - Folkestone 1st March 1919 Commemorative Cover The RE badge denotes the fact that the RE were responsible for Forces Mail. Stamps: 1s Royal Air Force 1918-1968 commemorative, issued 29 May 1969. Cachet: Flown Cover Received Folkestone 1 Mar 69. Border: Solid line in red. Special Handstamp: 50th Anniversary First Scheduled Airmail Service Germany-United Kingdom BFPS 1077, Köln's coat of arms shown to the left. 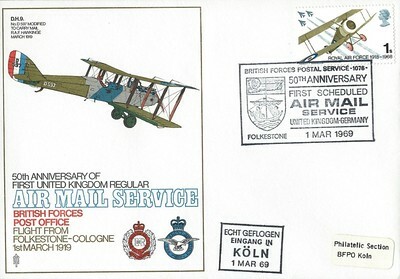 50th Anniversary of First UK Regular Air Mail Service Flight from Folkestone - Cologne 1st March 1919 - see British Pathé video. http://www.britishpathe.com/video/air-post-to-cologne/query/Air+mail Commemorative Cover The RE badge represents the fact that the RE were responsible for Forces Mail. Stamps: 1s Royal Air Force 1918-1968, commemorative, issued 29 May 1969. Cachet: Echt Geflogen Eingang in Köln 1 Mar 69. Border: Solid line in olive. Special Hand Stamp: 50th Anniversary First Scheduled Airmail Service Germany-United Kingdom BFPS 1076, Folkestone's coat of arms shown to the left. 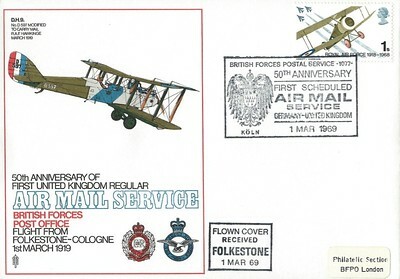 50th Anniversary of First UK Regular Air Mail Service Flight from Folkestone - Cologne 1st March 1919 - see British Pathé video. http://www.britishpathe.com/video/air-post-to-cologne/query/Air+mail Commemorative Cover The RE badge represents the fact that the RE were responsible for Forces Mail. Stamps: 1s Royal Air Force 1918-1968, commemorative, issued 29 May 1969. Cachet: Echt Geflogen Eingang in Köln 1 Mar 69. Border: Solid line in red. Special Hand Stamp: 50th Anniversary First Scheduled Airmail Service Germany-United Kingdom BFPS 1076, Folkestone's coat of arms shown to the left. 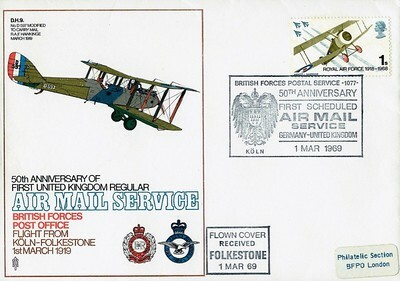 50th Anniversary of First UK Regular Air Mail Service Flight from Folkestone - Cologne 1st March 1919 - see British Pathé video. Commemorative Cover The RE badge represents the fact that the RE were responsible for Forces Mail. Stamps: 1s Royal Air Force 1918-1968, commemorative, issued 29 May 1969. Cachet: Echt Geflogen Eingang in Köln 1 Mar 69. Border: Solid line in red. Special Handstamp: 50th Anniversary First Scheduled Airmail Service Germany-United Kingdom BFPS 1077, Köln's coat of arms shown to the left. Note: Special Handstamp Error. SHS BFPS 1077, instead of 1076, has been used to cancel the stamp. The cover has also been given the wrong cachet "Flown Cover Received Folkestone 1 MAR 69" instead of "Echt Geflogen Eingang in Köln 1 Mar 69". Royal Engineers Weekend at Home July 12-13 1969 Commemorative cover Stamps: 5ᵈ commemorative, "Canterbury Cathedral", issued 28 May 1969. Cachet: Ubique stamp, RE Cipher, RE badge. Special Handstamp: Royal Engineers Cove, BFPS 1095. Note: This covers image contains more yellow pigment in it thereby making the title colour a more greenish gold as well as altering the blu, green and red colours. Note: This covers image contains more yellow pigment in it thereby making the title colour a more greenish gold as well as altering the blu, green and red colours. 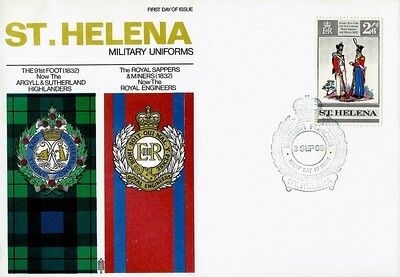 Covers shows 2 Royal Engineers from 1813, 9d stamp shows the uniform of the Royal Engineers 1786. Stamps: 4 x Gibraltar commemoratives, Uniforms, 2s, 1ᴰ, 6ᴰ and 9ᴰ, issued 6 November 1969.